Hadassah National President says her charity was 'never involved in managing' Jerusalem's Hadassah Medical Center. The President of Haddasah (the Women's Zionist Organization of America) has spoke to Arutz Sheva about the ongoing crisis at the charitable group's flagship Jerusalem hospital, Hadassah Medical Center. Yesterday it was revealed that the hospital's administration is waiting for a 100 million shekel (about $25.8 million dollars) bailout from the ongoing debt crisis from the Finance Ministry and the Hadassah Zionist Women's Organization, according to a source close to the case. After failed talks with the Israel Medical Association (IMA), the administration decided over the weekend to pay workers - who are already reeling over budget cuts and minimal salaries - only half their salaries this month as a result, and only plans to pay them about 90% of their salaries in total. In response, medical staff still working at the medical center on Shabbat and holiday hours staged a mass walk-out for several hours on Sunday. The IMA had called for the crisis to be immediately resolved and for an end to the strikes, and demanded that workers with full wages due them to be paid immediately ahead of the planned walkout. 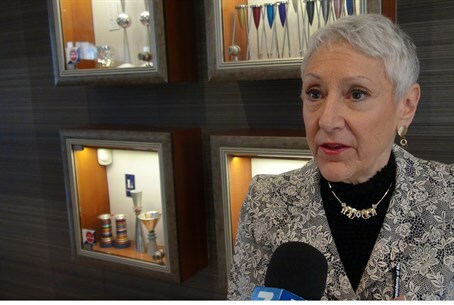 In an interview with Arutz Sheva, Hadassah National President Marcie Natan outlined how the charity was responding to the crisis. She said her main worry - and that of the Hadassah Medical Organization (HMO) which funds the hospital - is the negative impact ongoing strikes and funding shortages are having on those in need. "My biggest concern is that we have a hospital with thousands of beds which is now unable to serve the population of Jerusalem," Natan said. The crisis is "truly painful for Hadassah", but could have been avoided, she added, noting that her organization had flagged the worsening financial situation which government officials "a couple of years ago". "Intense negotiations" are still ongoing. Some have wondered why an essentially private hospital should be bailed out using public funds, but Natan rejected such an argument offhand. Her organization would continue to fund "state of the art research", "exclusive equipment" and other such important projects, but the role of providing basic healthcare to Israeli citizens is the state's responsibility, she insisted. "We are a hospital which acts as a public hospital here in Israel, and just as the State of Israel supports every other public hospital, the healthcare of the people who come to Hadassah should be in the hands of the government," she insisted. "It is unconscionable that the state doesn't see that it has a responsibility to its citizens to provide for its healthcare." Natan said donors were indeed asking "good questions" about the fiasco, and said doubts about the Israeli government's commitment to provide a safety net for the hospital was "affecting Diaspora Jewry". "A world of Jews who have supported Israel are looking at this situation and are saying 'if the government of Israel is prepared to ignore a crisis that so involves the Diaspora, would it react the same way in other situations?'" She also emphasized that "Hadassah will never be involved in the management of the hospital" itself. "We never have and we won't be," she said. Nonetheless, she conceded that HMO's board needed to be more involved in ensuring accountability and preventing mismanagement of funds. "The HMO board, which has been asking questions right along and not getting fully transparent responses, will now understand its obligation to be far more inside the hospital if necessary and certain that we understand the real day to day... financial situation." Natan spoke with Arutz Sheva TV at the annual gathering of the Conference of Presidents of Major American Jewish Organizations.